FIG Asia Pacific Capacity Development Network participated in various meetings in November and December. Read more for an update on FIG AP CDN activities. The FIG Asia Pacific Capacity Development Network (FIG AP CDN) participated in the 3rd Meeting of Pacific Geospatial and Surveyors Council, which was convened in Nabua - Suva, Fiji on the 24-25 November 2016 at the Pacific Community “Pasifika Conference Room”, Lotus Building. Meetings of this nature, as well as technical projects, have been support by regional developing partners as shown below. FIG have been actively involved in geospatial infrastructure matters in this region since the FIG 2013 Small Island Developing States (SIDS) symposium by attending conferences in region, providing independent technical and administrative advice to the PGSC, and advocating the importance of geospatial professionals and surveyors. 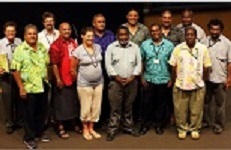 At this meeting, there were 13 Pacific Island member countries in attendance, and also representatives from agencies such as Geoscience Australia, Land Information New Zealand, Geoscience Division of the Pacific Community, and the UK Hydrographic Office. FIG had two officers present, Mr Mikael Lilje (Vice President Elect 2017-20) and Mr Rob Sarib (Chair AP CDN), and Dr John Dawson representing the UN GGIM AP. To begin proceedings, Professor Michael Petterson (Director of Pacific Community Geoscience Division), and Mr Raymond Bojczuk (First Secretary, Australian High Commission, Suva) delivered inspirational presentations to the PGSC. Both speakers emphasised the value and importance of geospatial and survey information, and also the role of the PGSC to address the economic, social and technological challenges faced by Pacific Island nations. After the several addresses offering support and encouragement from Mr Lilje, Dr Dawson and PGSC Chair Mr Faatasi Malologa (Director of Tuvalu Lands & Survey Departments), work to finalise the content of the “Pacific Geospatial and Survey Strategy” began. Refinement of the strategy continued for the next two days, and it was subsequently endorsed by the PGSC. Discussions in relation to the strategy and its formalisation were facilitated by Mr Jens Kruger, Dr Dawson, Mr Sarib and Mrs Molly Powers-Tora. The remainder of the meeting was spent workshopping the detail plans for the implementation and communication of the strategy, and the official launching of the strategy for mid-2017. Four PGSC working groups were then created to examine and prepare actions for 2017 against each of the four strategic goals and their activities. Chair Mr. Malologa and Vice Chair Mr Paserio Samisoni (Fiji) were re-elected as the office bearers for 2017. It was suggested that Pacific countries must engage with “users / stakeholders” to discover what vertical surfaces are pertinent to their needs; what the present and future primary uses / applications of a vertical surface; and what are the accuracy requirements and specifications for each vertical surface identified. It was suggested that Pacific countries should consider a “fit for purpose” approach when selecting the appropriate vertical surface as datum. In other words have a development plan that meets the needs of today and allows the system to be improved incrementally. It was suggested Pacific countries consider adopting a “mean seal level” surface for their local reference and / or working vertical surface. It was generally agreed that it was important for the Pacific countries to model or determine the relationship / linkage between the various vertical surfaces and datasets, that is the land, water and ellipsoidal / reference frame. It was then generally agreed that this was to be achieved using separation models (such as a geoid) based on gravimetric, geometric or combined information. It was recommended that Pacific countries begin to discover and audit their vertical surface data – which includes validating, cleansing, and ascertaining the quality (uncertainty or accuracy) of terrestrial levelling networks, tidal information, gravity observations, elevation models, and GNSS observations on known points of height. It was suggested that Pacific countries consider perform necessary field observations (GNSS or terrestrial) to establish (or confirm) connections between the different vertical surfaces. Pacific countries confirmed that datum modernisation not only involves horizontal co-ordination, it also involves vertical measurements, relevant transformation and geoid models and the importance of metadata and standards. It was suggested that Pacific countries should consider what regional projects (or infrastructure) can assist with the development of a vertical reference system for the region, such as gravity measurements / observations, GNSS tide buoys, mobile or portable tide gauges, more GNSS CORS, densification of terrestrial levelling networks etc. Pacific countries confirmed the importance of working collaboratively, the sharing of data and resources, and exchange of experiences. It was suggested Pacific countries use the PGSC to approach other government agencies from neighbouring countries in the region for technical assistance. 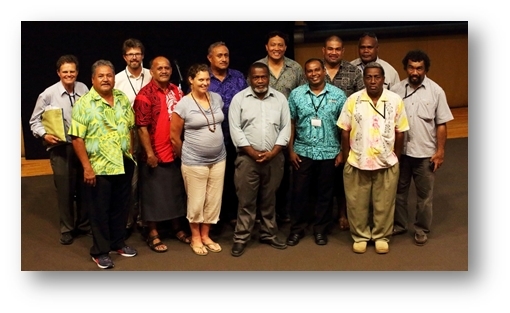 As per previous years the Pacific Geographic Information Systems (GIS) and Remote Sensing (RS) User Conference was held at the Japan ICT Centre, University of the South Pacific (USP). The technical sessions spanned over 4 days and concluded with 1 day of workshops. According to the organisers the event had almost 300 registered guests and nearly 80 presentations. The use of open source GIS in combination with “COTS” to do manage data and information. Although “internet of things”, “cloud computing” and online computations are global trends in the GIS, for the Pacific region this type of digital infrastructure and supporting communication networks are not well developed to facilitate implementation.